BSF is stands for “Border Security Force”, is one of the major defiance force of India. 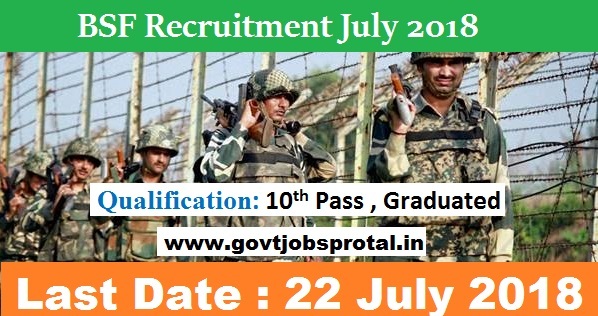 BSF is looking to heir fresher Indian candidates who are willing to serve their nation and full fill all the eligibility criteria required for these Government jobs. BSF Recruitment department issued official notification related to this constable vacancy 2018. We took this piece of information from that PDF file only. That PDF file little a bit typical to understand so that’s why we try our best to make this post easy to understand by splitting this article into different sections. Read each one section carefully to understand all facts related to this BSF Recruitment 2018. We share various sections below which make you to understand this article easily. Each section contains particular information related to this BSF Recruitment process. Those who have completed their education up to 10th level and after that complete their ITI diploma in the relevant trade can apply. Those who are wishing to apply these Government jobs must have age in between 18 to 25 years. What is the Application Fee for applying this BSF Recruitment 2018? BSF Recruitment is inviting these Government job applications for free of cost. The Indian candidates who are wishing to apply this BSF Recruitment can apply by paying ZERO application fee. How we can apply for these BSF Vacancies 2018? How candidates are going to be selected for these BSF Jobs 2018? BSF Recruitment department decide two round of selection to fill up these BSF Vacancies. The First round will be the written test. Those who cleared the written test will go to the personal interview round for final selection. 22 July 2018 is the Last Date for applying these Jobs.